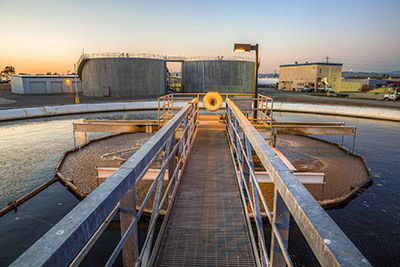 Oro Loma is proud to continue to provide the best possible wastewater collection and treatment services to its customers at the lowest rates in Alameda County. 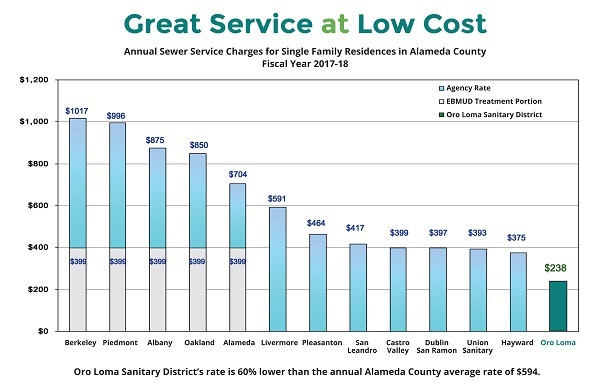 Our residential sewer service charge is 60% lower than the Alameda County average. All sewer service charges shall be developed using the unit costs listed in Table A-1, as regulated by Ordinance No. 37. Any sewer service charges not specifically identified in this Resolution will be prepared using the unit costs of Table A-1 and the appropriate parameter from the Table. Sewer service charges for this class of customer is $3.273 (2016), $3.518 (2017), $3.782 (2018), $4.066 (2019), $4.371 (2020) per actual water use, measured in hundred cubic feet (ccf), with a minimum annual charge of $181.00 (2016), $194.00 (2017), $209.00 (2018), $224.00 (2019), $241.00 (2020). Sewer service charges for this class of customer is $2.406 (2016), $2.586 (2017), $2.780 (2018), $2.989 (2019), $3.213 (2020) per actual water use, measured in hundred cubic feet (ccf). Sewer service charges for this class of customer shall be prepared based upon actual flow and loadings, times the unit costs as follows, with a minimum annual charge to be collected in the amount of $181.00 (2016), $194.00 (2017), $209.00 (2018), $224.00 (2019), $241.00 (2020). Users of the District’s sewerage system serviced by lift stations constructed after January 1, 1995, shall pay an additional annual charge as determined by District to cover renewal and replacement and operation and maintenance costs of the lift station. Charges for residential customers shall be a flat fee regardless of type of unit. Charges for commercial customers shall be based on flow volume. B. Lift Station 14 (Canyon Drive) provides sewer service to Tract 6833 (Henry Lane) and residents of the Five Canyons Development generally east and west of Five Canyons Parkway, except Tract 6196. The parcels of Tract 6179, which are tributary to this lift station, are charged separately under Lift Station 15. New Lift Stations: Should the District, after the effective date of this Ordinance, desire to approve construction of a new lift station intended to serve one or more new customers, the annual user charge for connection to that station shall be set by the Board of Directors and approved by motion. Such charges specified in the motion will be incorporated into this Ordinance at an appropriate future date. Certain District commercial customers have unique situations which require billing computations based on Equivalent Dwelling Units (EDUs). In these cases, District staff determines the appropriate annual charges which are memorialized in a written agreement between the parties and approved by Oro Loma Sanitary District Board action. * Includes application review and inspection. ** Includes all costs for sampling events, analysis, program administration and equipment. The District’s policy is not to pay any interest on refunds or claims connected with sewer service charges, developer deposit accounts, or other sums deposited with the District.